It soon became apparent that the Tams were not high on the list of Finley’s priorities. Amenities like programs began to disappear, and morale suffered as players began to wonder if they would receive paychecks and if they would clear the bank when they did. After two seasons of this, the ABA stepped in and took control of the team. ABA Commissioner Mike Storen resigned his position with the league to take over the operation and run the team in Memphis. Storen lined up several notable local figures as co-owners of the new team including musician Isaac Hayes and Holiday Inn founder Kemmons Wilson. Storen named the new team the Memphis Sounds and developed a new red and white color scheme and logo. Storen cleared out the former Tams roster and brought in veteran players such as Mel Daniels, Freddie Lewis, Roger Brown, Chuck Williams, Collis Jones, George Carter, Rick Mount and Julius Keye. 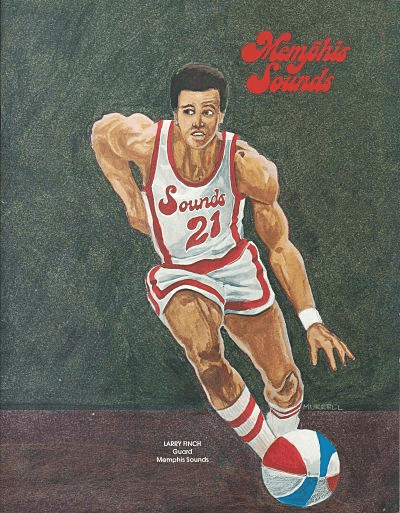 The only player who had played for the Tams who appeared in uniform for the Sounds was Larry Finch, a local favorite because he had played college basketball at Memphis State University.